Figure 10-1. 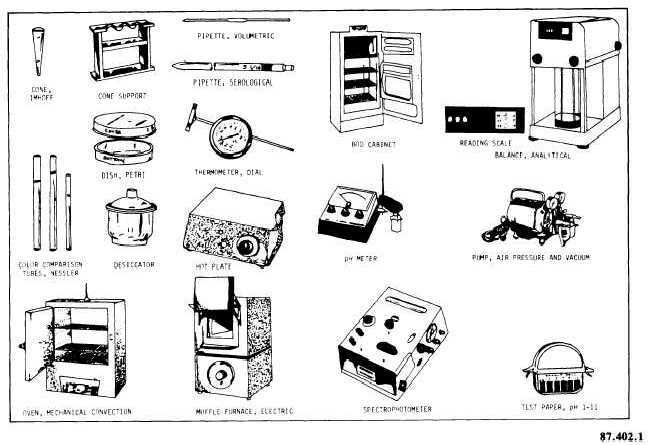 - Illustrations of laboratory apparatus - Continued. manufacturer's instructions for the proper maintenance procedures for each piece of equipment. Table 10-11 gives some basic guidelines for the maintenance and use of various types of laboratory equipment. Safety should be vital to all personnel conducting sewage tests. Good housekeeping is essential in a laboratory to prevent mishaps and damage to expensive equipment. Each piece of equipment should be cleaned and returned to its proper place after being used. When conducting sewage tests, it is always wise for the operator to avoid actual contact of the hands with the sewage samples or other filth. Hands must be kept out of the nose, mouth, and eyes. It is particularly important to use gloves when the hands are chapped, or burned, or the skin is broken from any wound. Operators should thoroughly wash their hands with plenty of soap and hot water before eating.